Need to walk two dogs at once? Try our no tangle leash, designed with you in mind. Utilizing a dual swivel between the handle and the coupler allows the dogs to move freely and even walk over or around each other and still not get tangled. The leash includes an handle, adjustable from 6" to10" followed by a swivel connected to two leashes. 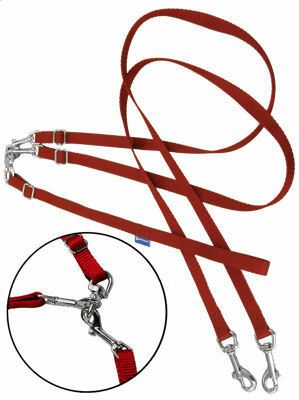 Individual leashes adjust from 30" to 48" to allow a combination of dog sizes to walk together. Each leash is made with a snap at each end. Need an extra leash in a flash? Just unsnap one of the leashes and adjust the slide to make a handle and shazam ... you have a walking leash. Also available in Latigo Leather in an assortment of colors.